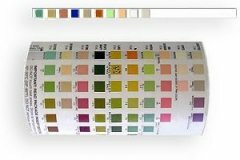 Professional urine reagent test strips for the rapid determination of Ketones (URS-K), Glucose, Protein and pH (URI-3) plus Leukocytes, Nitrites, Ketones, Bilirubin, Blood, Urobilinogen, and Specific Gravity (URI-10) levels in urine. The URS-UTI is a single use test specific for detection of urinary tract infections. These are the diagnostic reagent strips used by physicians, clinics and hospitals to initially screen for suspected and/or existing health conditions. 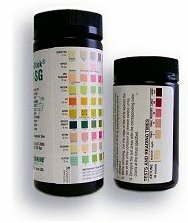 Simple to use, urine diagnostic reagent strips can provide early indications of developing health problems and identify potential abnormal functions requiring more extensive testing. Additionally, routine use is frequently recommended by physicians for monitoring certain existing and chronic health conditions. Is your body burning fat cells? The presence of elevated levels of ketones in human urine is a primary indicator that the body is in ketosis. Ketosis simply means that the body's stored fat cells are being utilized as a primary fuel source to produce energy. The by-products of fat metabolism are ketones. Ketones are not stored by the body and are eliminated as detectable waste products in urine. Therefore, monitoring the level of ketones is presumptive of, and directly correlated to the metabolizing, or burning of stored fat cells to produce energy. Likewise the conclusion can be drawn that the higher the concentration of ketones in urine, the higher is the amount of fat cells metabolized by the body. Ketone test strips are used routinely to help measure the progress of dieters especially those maintaining a low carbohydrate diet. Additionally, ketones are monitored in individuals with Type 1 diabetes. In diabetics, high ketone levels indicate ketoacidosis, a complication of inadequate insulin levels that can lead to diabetic coma. In overall health considerations, high ketone levels are generally an indication of abnormal nutritional conditions, including starvation, fasting, anorexia, high protein or low carbohydrate diets. Depending on the test and specific reagent panel, abnormal levels of specific chemical compounds contained in urine can be easily and readily identified as potential risks factors to overall health and/or indicators of underlying health problems. The significance of each reagent panel is discussed in detail in the Urinalysis Technical Document. Completely immerse the reagent pads of the strip in the urine sample and then remove immediately to avoid dissolving out the reagent pads. While removing the reagent strip, run the edge of the strip against the rim of the specimen container to remove excess urine. Hold the strip in a horizontal position to prevent possible cross contamination of chemicals located in adjacent reagent pads. Compare the color change of reagent pads to the corresponding color chart on the bottle label. Read results according to the chart's time frame for each panel tested. Record the results of your readings for discussion and/or evaluation with your physician or healthcare provider and then discard the used reagent strip. Note: For a more complete discussion of expected results and potential causes of unexpected results see the Urinalysis Reagent Strip Technical Document. � Glucose: Glucose should not be detected in normal urine. Small amounts of glucose may be excreted by the kidney. These amounts are usually below the sensitivity of this test but on occasion may produce a color between the negative and the 1/10 g/dL color blocks. 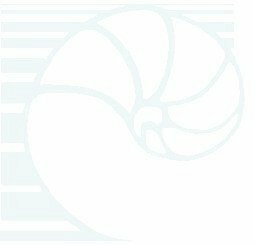 Results of 1/10 g/dL (if consistent) or higher are considered to be significantly abnormal and professional advice should be obtained immediately. � Protein: Protein is usually not detectable in normal urine. A color matching any block greater than "Trace" indicates significant proteinuria. For urine of high specific gravity, the test area may most closely match the "Trace" color block even though only normal concentration of protein is present. Clinical judgment and advice along with further tests would be required to properly evaluate the significance of consistent "Trace" readings. � pH: Normal and abnormal urinary pH may range from 5 to 9. Readings are generally situation specific and should be discussed with your healthcare professional. Generally, certain conditions manifest in low or high consistent pH readings and should be professionally evaluated. First morning urine from healthy individuals will usually range from 5 to 6. � Additional Panels (URI-10): Expected results for Leucocytes, Nitrites, Ketone, Bilirubin, Blood, Urobilinogen and Specific Gravity (URS-Strip 10) including normal ranges are included in a complete instruction and use sheet. In most cases, for these additional test panels, you want to obtain a normal, or negative result meaning that the reagent panel does not change color*. A color change in one or more of the reagent panels normally indicates an unexpected result. For example, a significant color change in the leukocyte panel would indicate an elevated level of white blood cells indicating a possible infection. A color change, or abnormal reading in the blood panel could indicate undiagnosed internal bleeding. * NOTE: For a more complete discussion of expected results and potential causes of unexpected results see the Urinalysis Technical Document. URS-UTI, URS-K, URS-3 and URS-10 urinalysis tests strips are a intelligent first step in overall health self-evaluation. They can be an effective, low cost diagnostic aid in early detection of potential health problems. The user should remember that test results are visual and qualitative only and must be discussed with a healthcare professional prior to any conclusion or definitive diagnosis.